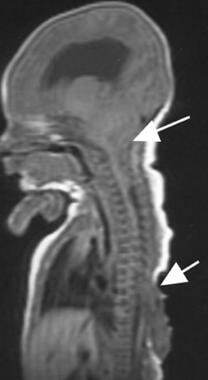 A thoracic-level myelomeningocele (short arrow) is seen in a patient with a Chiari II malformation (long arrow). Sagittal T2-weighted magnetic resonance image in a patient with a Chiari II malformation. This image shows a thoracic-level myelomeningocele (arrows). The spinal cord, in addition to the thoracic placode, also extends distally and is further tethered at the sacral level. Sagittal ultrasonogram in a patient with a Chiari II malformation. This image shows the thoracic spinal cord (arrowheads) and myelomeningocele (arrows). Note the tethering of the placode at the site of the dysraphic defect. As mentioned above, the Chiari II malformation is a complex deformity of the calvarium, dura, and hindbrain, and it is almost always associated with myelomeningocele. The spectrum of abnormalities in Chiari II malformation is broad, with many findings reported. Osseous changes in Chiari II malformation include a lacunar skull or luckenschadel; concave clivus and petrous ridge alterations; a small posterior fossa and gaping foramen magnum; and low-lying transverse sinuses. Almost all patients manifest dysplasia of the membranous bones of the calvarium (lacunar skull or luckenschadel), which appears as clusters of areas of thinning, pits, and fenestrae that are most prominent near the vertex or torcular herophili (see the following image). These findings may be observed in utero in a fetus as early as at 8 months of gestation. The lacunar skull typically persists until the age of 1-3 months and then disappears after approximately at 6 months of age, regardless of whether progressive hydrocephalus is present. Subtle calvarial thinning and scalloping may persist into adulthood. Deep scalloping between the bony septations that characterize the lacunar skull (luckenschadel) (arrows) are best appreciated on an axial computed tomography section, as in this patient with a Chiari II malformation. Clivus and petrous ridge alterations include concavity of the posterior aspects of the petrous temporal bones (see the first image below) and an abnormal clivus that is often short, with a concave configuration similar to that of the petrous ridges (see the second image below). Axial computed tomography scan in a patient with a Chiari II malformation. This image shows a gaping, somewhat heart-shaped tentorial incisura (large arrowheads) that appears to be completely plugged with the upwardly herniating cerebellum. The cerebellar hemispheres extend anteromedially (small arrowheads) and almost completely engulf the brainstem. The petrous ridges are concave (arrows). 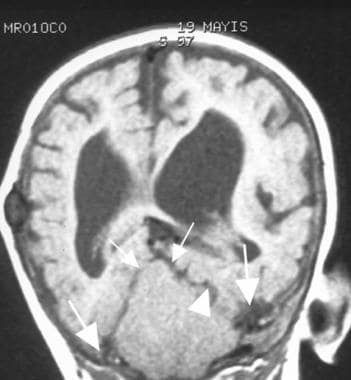 Sagittal T1-weighted magnetic resonance image of posterior fossa abnormalities in Chiari II malformation: (1) colpocephaly; (2) beaked tectum; (3) cascade of an inferiorly displaced vermis behind the medulla; (4) elongated, tubelike fourth ventricle; (5) low-lying torcular herophili; (6) cerebellar hemispheres wrapping around the brainstem anteriorly; (7) concave clivus; (8) medullary spur; and (9) medullary kink. Other osseous changes include a small posterior fossa and gaping foramen magnum, as well as low-lying transverse sinuses. The posterior fossa is exceptionally small; the foramen magnum is larger and rounder than usual, and the internal occipital protuberance is situated just superior to the foramen magnum. The transverse sinuses and torcular herophili are low lying (see the following images). Coronal T1-weighted magnetic resonance image in a patient with a Chiari II malformation. 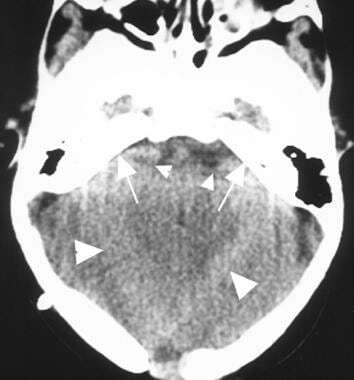 This image shows low-lying transverse sinuses (arrows), hydrocephalus, and a small posterior fossa. A hypoplastic tentorium cerebelli with gaping incisura (arrowhead) is present with a towering cerebellum (small arrows). Changes to the dura included a fenestrated falx, hypoplastic tentorium, and heart-shaped incisura. The falx almost always shows partial absence, hypoplasia, and/or fenestrations (see the first image below). The tentorium is hypoplastic, attaching to the occipital bone far caudally, just above the foramen magnum (see the second image below), and the hypoplastic tentorial leaves arise laterally from the low-lying transverse sinuses (see the third image below). Axial T2-weighted magnetic resonance image in a patient with a Chiari II malformation. This image shows a hypoplastic fenestrated falx cerebri with striking interdigitation of the gyri (arrows). Changes to the cerebellum, medulla, and spinal cord include a cerebellar peg, medullary kink, and a towering cerebellum or vermian pseudotumor. In addition, the fourth ventricle is elongated and tubelike; the cerebellopontine cistern and the cisterna magna are obliterated; and the combined displacements of the spinal cord, medulla, pons, and cerebellum form a cascade of herniations, each of which compresses all of the tissue in front of it and displaces them anteriorly. In older patients, a wide subarachnoid space may be seen behind a vermis that is deeply grooved at the level of cervical nerve C1. The vertebral artery frequently loops on itself within the cervical canal and passes caudally to the level of cervical nerve C3. The possible cause of this groove may be the pulsatile effect of the vertebral artery on the adjacent cerebellum. Protrusion of vermis and hemispheres through the foramen magnum (90%) results in craniocaudal elongation of cerebellum behind the spinal cord, or cerebellar peg (see the following images). Sagittal midline T1-weighted magnetic resonance image in a patient with a Chiari II malformation. This image shows a large massa intermedia (long arrow) and a beaked tectum (short arrow). Other posterior fossa abnormalities are also seen in this patient. The medulla is kinked inferiorly (75%) and lies dorsal to the spinal cord, which is unable to descend because of competent dentate ligaments (see the images below). In addition, the corners of the cerebellum are wrapped around the brainstem, pointing anteriorly and laterally (also shown in the images below). The cerebellar hemispheres and vermis also extend above the incisura of the tentorium (see the following image). Changes to the midbrain and the third and lateral ventricles include a beaked tectum, hydrocephalus, colpocephaly, and prominent massa intermedia. About one third of patients have a partial block at the level of the ambient cisterns. Variable degrees of fusion of the colliculi and tectum result in prominent beaking and inferior displacement of the tectal plate (see the images below). Sagittal midline ultrasonogram shows a large massa intermedia (long arrow) and a beaked tectum (short arrow). This image also shows obliteration of the cisterna magna and the fourth ventricle, as well as compression of the pons and brainstem. Axial T1-weighted magnetic resonance image in a patient with a Chiari malformation. This image shows a beaked tectum (arrows) and colpocephaly (arrowheads). Ventricular dilatation (hydrocephalus) is present in 98% of patients (see the following image), and 90% require a shunt. Colpocephaly, in which the occipital horns and atria are often mildly enlarged because of maldeveloped occipital lobes, especially in the presence of a malformation involving the corpus callosum, may be seen (see the images below). A prominent massa intermedia, herniation of the third ventricle into the suprasellar cistern, and an enlarged suprapineal recess are often seen (see the following images). Frequently, a large third ventricle is present as well. Inferior operativelike view on 3-dimensional computed tomography scan. 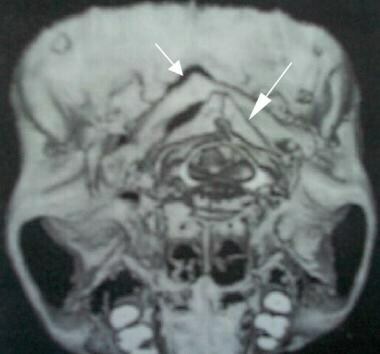 This image shows malrotation of the posterior arches of C1 (long arrow) and C2 (short arrow). Courtesy of Duffau et al. As discussed, the Chiari II malformation is a complex anomaly with skull, dural, brain, spinal, and spinal cord manifestations. Traditionally, when signs and symptoms were suggestive of a Chiari II malformation, plain radiography of the head and spine was performed, followed by myelography. Because myelography is an invasive procedure, clinicians were reluctant to perform the test until the severity of the symptoms warranted it. CT scanning is useful for appreciating the luckenschadel skull (see the image below), and this modality can be used to identify the other bony changes seen in the Chiari II malformation, such as the large foramen magnum, the flat floor of the posterior fossa, and the scalloping of the petrous pyramids. CT scanning is also excellent for assessing and following up ventricular size before and after shunt placement (approximately 80-90% of patients have hydrocephalus). Plain radiographs of the cervical spine, including flexion and extension views, can be used to assess any pathologic spinal movement. 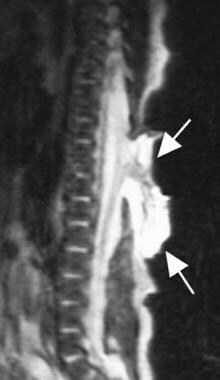 Depicted abnormalities include widening of the upper cervical spinal canal and incomplete bony arching of C1 in as many as 70% of cases with replacement by a periosteal band that contributes to neural compression. In addition, plain radiography is excellent for demonstrating scoliosis, segmentation errors, and lack of fusion of the dorsal laminae in the spine. Plain radiographic findings of Chiari II malformation do not have diagnostic importance except for the bone abnormalities associated with scoliosis and diastematomyelia and for ventriculoperitoneal shunt malfunction. CT scanning is an efficient diagnostic examination in following up infants and children with hydrocephalus, but it exposes the patient to ionizing radiation. The value of CT scanning in diagnosing cerebral gyral malformations and spinal cord pathology is limited. MRI is relatively expensive, is contraindicated in patients with pacemakers, and is not tolerated by all patients. MRI requires patient cooperation or sedation. Ultrasonography is limited to the period before the closure of the anterior fontanelle, which serves as an acoustic window. Abnormalities such as gyral, dural, tentorial, and vermian anomalies accompanying Chiari II malformations are difficult to visualize with ultrasonography. Failure to diagnose a Chiari II malformation and its associated anomalies in a neonate or a child can cause serious brain and spinal complications; failure to identify early cranial and spinal cord lesions may result in delayed intervention and permanent neurologic deficit; and failure to make the correct diagnosis (eg, cerebellar tumor instead of Chiari II malformation) can cause morbidity and mortality resulting from surgery. Ultrasonography can be performed during the antenatal period as a screening method and in high-risk pregnancies; with a careful ultrasonographic examination, cranial and spinal pathologic changes related to Chiari II malformations in the fetus can be seen and diagnosed antenatally. Reportedly, a lacunar skull can also be detected by using ultrasonography in the fetus. To confirm the diagnosis and gain detailed information, MRI can be used antenatally. In addition, MRI has been used as a diagnostic tool during the antenatal period, allowing the intrauterine diagnosis, and even treatment, of spina bifida. Plain radiography has been used most frequently for examining bone anomalies, scoliosis, and ventriculoperitoneal shunt malfunction. Plain images can show enlargement of the cervical spinal canal and posterior midline fusion defects, as well as anterior bony abnormalities, such as C1 and C2 dislocation. Routine radiography can demonstrate luckenschadel in neonates with myelodysplasia. Additional bony changes that can be seen include scalloping of the posterior surface of the petrous pyramids and the clivus. Plain radiographs have diagnostic importance in the evaluation of cranial and vertebral bony abnormalities and in the evaluation of ventriculoperitoneal shunt disconnection or displacement of the shunt catheter. 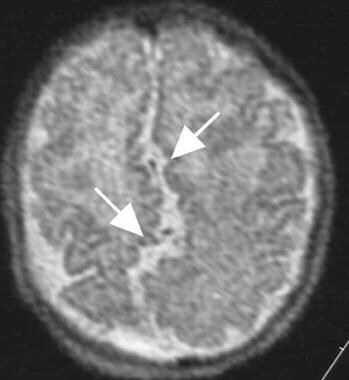 CT scans are used most commonly in patients with Chiari II malformation for the diagnosis of hydrocephalus and for the evaluation of suspected shunt malfunction. Luckenschadel can be demonstrated on CT scans (see the image below). Abnormalities are composed of areas of thinning or pits within the calvarial bone. The areas of thinning typically occur on the inner surface of the skull, but they have been seen on both the inner and outer aspects. Within each of the depressions on the inner aspect of the skull, brain tissue can be seen bulging into the bony defect. 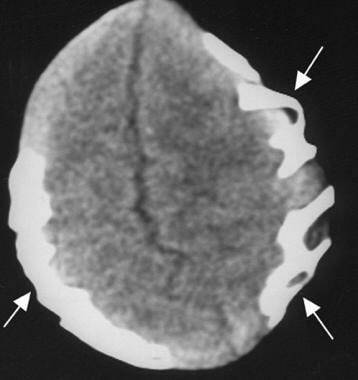 CT scans may demonstrate an abnormally large foramen magnum, the flat floor of the posterior fossa, and scalloping of the petrous pyramids and clivus (see the following image). CT scanning also demonstrates tectal beaking, cerebellar tissue wrapping around the brainstem, fenestrations of the falx, manifestations of hydrocephalus, and shunt malfunction. CT myelography is rarely performed in patients with Chiari II malformation because of the advent of MRI. High-resolution CT scanning of the spine may be essential for surgical planning, particularly in patients with severe scoliosis and associated complex segmentation anomalies. Three-dimensional (3-D) CT scans and CT angiograms can be used for a precise analysis of complex osseous malformations, of the relationships between vascular and bony structures, and of postoperative changes in the bone (see the images below). Postoperative 3-dimensional computed tomography scan. 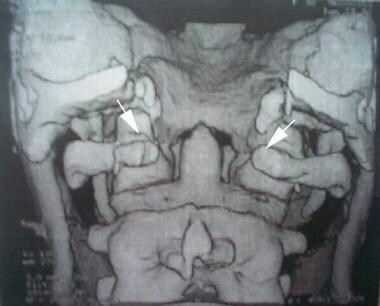 This image shows osseous decompression with a large opening of the foramen magnum and resection of the posterior arch of the atlas (arrows). Courtesy of Duffau et al. CT scanning is the routine diagnostic method for following up patients with a Chiari II malformation and associated hydrocephalus. An encysted fourth ventricle is one of the causes of shunt malfunction. Because the internal regulation of the shunt valve is usually affected by intracranial pressure changes, the pressure dynamics between infratentorial and supratentorial compartments are important. CT scanning also is helpful for follow-up to assess the dynamic changes in the infratentorial and supratentorial ventricular systems. Chiari II malformation associated with subtle gyral malformations and spinal cord abnormalities, such as a syrinx, are often missed on routine CT images. Thin-section sagittal and/or coronal reformatted CT images may be useful for assessing spinal anomalies. The most common cause of a syrinx of the spinal cord in patients with a Chiari II malformation is ventriculoperitoneal shunt malfunction. All patients with a Chiari II malformation and syrinx (as detected with spinal MRI) should undergo cranial CT scanning and a radiographic shunt series to exclude shunt malfunction as a cause for appearance or worsening of the syrinx. When posterior fossa and cervical CT scans are evaluated individually, the craniocaudal elongation of cerebellum in a Chiari II malformation can be confused with cervical spinal tumors and cerebellar tumors that ascend through foramen magnum or cause cerebellar herniation. Spin-echo T1-weighted sagittal and coronal images and T2-weighted sagittal images, including those of the cervical region, should be obtained. In the authors' department, sagittal images are obtained with 3- or 4-mm thickness and 1-mm gap, and axial and coronal scans are obtained with 5-mm thickness and 1- or 2-mm gap. Craniocervical magnetic resonance (MR) examination is performed in children with myelomeningocele, whereas spinal MR examination is performed in patients with a Chiari II malformation. Hindbrain anomalies, hydrocephalus, and syrinx cavities in the spinal cord are well demonstrated on T1-weighted images. The extent of the S-shaped medullary kink can be easily evaluated by using sagittal MRI in patients with a Chiari II malformation (see the first 2 images below). MRI of the head is easily performed to assess the size and position of the ventricles, and it provides important additional information (see the first and third images below). Enlargement of the massa intermedia, occlusion of the cerebral aqueduct, and beaking of the tectum are best evaluated by using a sagittal projection on MRI (as shown in the images below). Gyral interdigitation, cerebral gyral anomalies, an engulfed brainstem, and the level of the medullary kink can easily be evaluated by using axial MRI. MRI enables accurate, objective, and detailed identification of spinal cord and vertebral abnormalities, including syringomyelia and diastematomyelia, both preoperatively and postoperatively (see the following images. 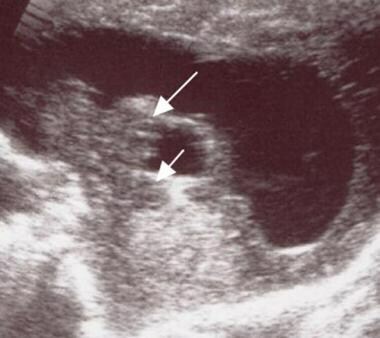 The ultrasonogram is from the same patient as the first 2 images below). MRI has also been used as a diagnostic tool during the antenatal period, allowing the intrauterine diagnosis, and even treatment, of spina bifida. MRI is reliable and the best diagnostic method for distinguishing the differential diagnosis between Chiari II malformation and other craniocervical pathologies (see Differentials and other problems to be considered in Introduction). Although the soft tissue can be evaluated easily with MRI, bone anomalies that can be depicted easily on plain radiographs and CT scans may be missed on MRI. Commercially available equipment is used with a 3- to 7.5-MHz transducer, depending on the size of the patient's head. In newborns, 5- to 7.5-MHz transducers are used, and 3- to 5-MHz transducers are used in older infants. Scans obtained with the transfontanel approach or with the transducer placed directly over the cervical region can demonstrate the downward displacement of the vermis and the medullary kink. Ultrasonography is suited especially for evaluating the ventricular system in patients with a Chiari II malformation. 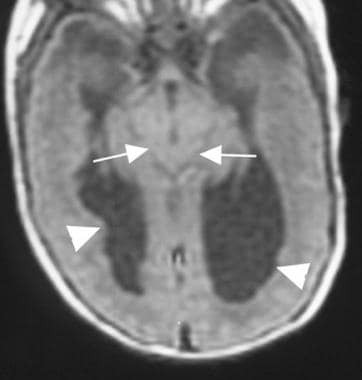 The lateral ventricles often take on a characteristic pointed appearance that is best demonstrated in the coronal projection. In addition, the lateral ventricles are frequently asymmetric, and they may appear colpocephalic, such that the cerebral mantle appears thinnest over the occipital horns (see the image below). 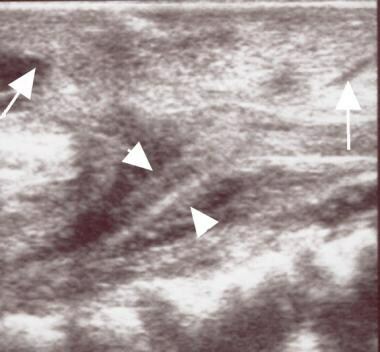 The choroid plexus of the lateral ventricle can be demonstrated best by using sagittal ultrasonographic sections; it is unusually prominent and has been described as having a drumstick configuration or dangling choroid. The characteristic prominence of the massa intermedia and beaked tectum that are often associated with the Chiari II malformation are also visible (see the previous image). The enlarged massa intermedia may appear to fill the third ventricle. A prominent anterior commissure, herniation of the third ventricle into the suprasellar cistern, and an enlarged suprapineal recess are often seen on midline sagittal sections. Dysgenesis of the hindbrain with downward displacement and elongation of the fourth ventricle, medulla, and the cerebellum results in a relatively small-appearing posterior fossa (see the previous image). In the neonatal period, spinal ultrasonography can be performed by using areas of dysraphism as an acoustic window. In this way, spinal abnormalities in patients with Chiari II malformation can be detected (see the following image). Ultrasonography is routinely used during the antenatal period as a screening method. 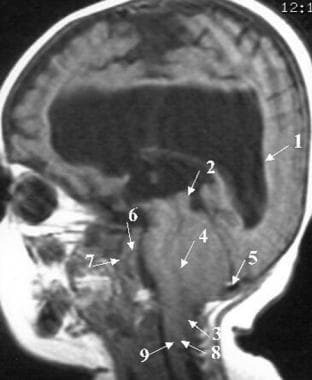 With careful examination, cranial and spinal pathologic changes related to Chiari II malformations in the fetus can be seen. Reportedly, a lacunar skull can be detected with the use of this modality in the fetus. Intraoperative ultrasonography is used for surgical purposes, especially lateral ventricular shunt tube placement in infants, and for aiding in the intraoperative placement of catheters into cavities in the syrinx. Ultrasonography is heavily operator dependent. Findings associated with the Chiari II malformation, such as pachygyria, polymicrogyria, heterotopias, and dural abnormalities, may be missed with the use of this modality. Digital subtraction angiography (DSA) can be helpful in excluding abnormal cases of Chiari II malformation that involve the vertebral artery before surgery. This procedure can be performed noninvasively by using MR angiography or CT angiography. MR angiography can be preferred, especially in infants and children, because of the associated radiation exposure with CT angiography. Gardner WJ. The Dysraphic States: From Syringomyelia to Anencephaly. Amsterdam, The Netherlands: Excerpta Medica; 1973. 5-14. Truivit CL, Backovich A. Disorders of brain development. Atlas SW, ed. Magnetic Resonance Imaging of the Brain and Spine. 2nd ed. Philadelphia, Pa: Lippincott-Raven; 1996. Weaver DD. Genetics of developmental defects. Wilkins RH, Rengachary SS, eds. Neurosurgery. 2nd ed. New York, NY: McGraw-Hill; 1996. 3424-5. Stevenson KL. Chiari Type II malformation: past, present, and future. Neurosurg Focus. 2004 Feb 15. 16(2):E5. [Medline]. Tubbs RS, Oakes WJ. Treatment and management of the Chiari II malformation: an evidence-based review of the literature. Childs Nerv Syst. 2004 Jun. 20(6):375-81. [Medline]. McLone DG, Knepper PA. The cause of Chiari II malformation: a unified theory. Pediatr Neurosci. 1989. 15(1):1-12. [Medline]. Miller E, Widjaja E, Blaser S, Dennis M, Raybaud C. The old and the new: supratentorial MR findings in Chiari II malformation. Childs Nerv Syst. 2008 May. 24(5):563-75. [Medline]. Goh S, Bottrell CL, Aiken AH, Dillon WP, Wu YW. Presyrinx in children with Chiari malformations. Neurology. 2008 Jul 29. 71(5):351-6. [Medline]. Ando K, Ishikura R, Ogawa M, et al. MRI tight posterior fossa sign for prenatal diagnosis of Chiari type II malformation. Neuroradiology. 2007 Dec. 49(12):1033-9. [Medline]. Wilberger JE Jr, Maroon JC, Prostko ER, et al. Magnetic resonance imaging and intraoperative neurosonography in syringomyelia. Neurosurgery. 1987 Apr. 20(4):599-605. [Medline]. Hunter JV, Youl BD, Moseley IF. MRI demonstration of midbrain deformity in association with Chiari malformation. Neuroradiology. 1992. 34(5):399-401. [Medline]. Geerdink N, van der Vliet T, Rotteveel JJ, Feuth T, Roeleveld N, Mullaart RA. Interobserver reliability and diagnostic performance of Chiari II malformation measures in MR imaging--part 2. Childs Nerv Syst. 2012 Jul. 28(7):987-95. [Medline]. [Full Text]. Geerdink N, van der Vliet T, Rotteveel JJ, Feuth T, Roeleveld N, Mullaart RA. Essential features of Chiari II malformation in MR imaging: an interobserver reliability study--part 1. Childs Nerv Syst. 2012 Jul. 28(7):977-85. [Medline]. [Full Text]. Woitek R, Prayer D, Weber M, Amann G, Seidl R, Bettelheim D, et al. Fetal diffusion tensor quantification of brainstem pathology in Chiari II malformation. Eur Radiol. 2015 Sep 2. [Medline]. Werner H, Lopes J, Tonni G, Araujo Júnior E. Physical model from 3D ultrasound and magnetic resonance imaging scan data reconstruction of lumbosacral myelomeningocele in a fetus with Chiari II malformation. Childs Nerv Syst. 2015 Apr. 31 (4):511-3. [Medline]. Mignone Philpott C, Shannon P, Chitayat D, Ryan G, Raybaud CA, Blaser SI. Diffusion-weighted imaging of the cerebellum in the fetus with Chiari II malformation. AJNR Am J Neuroradiol. 2013 Aug. 34 (8):1656-60. [Medline]. Duffau H, Sahel M, Sichez JP, Marro B. Three-dimensional computerized tomography in the presurgical evaluation of Chiari malformations. Acta Neurochir (Wien). 1998. 140(5):429-35; discussion 435-6. [Medline]. Sattar TS, Bannister CM, Russell SA, Rimmer S. Pre-natal diagnosis of occult spinal dysraphism by ultrasonography and post-natal evaluation by MR scanning. Eur J Pediatr Surg. 1998 Dec. 8 Suppl 1:31-3. [Medline]. Hori A. Tectocerebellar dysraphia with posterior encephalocele (Friede): report of the youngest case. Reappraisal of the condition uniting Cleland-Chiari (Arnold-Chiari) and Dandy-Walker syndromes. Clin Neuropathol. 1994 Jul-Aug. 13(4):216-20. [Medline]. Herweh C, Akbar M, Wengenroth M, Blatow M, Mair-Walther J, Rehbein N, et al. DTI of commissural fibers in patients with Chiari II-malformation. Neuroimage. 2009 Jan 15. 44(2):306-11. [Medline]. Callen AL, Stengel JW, Filly RA. Supratentorial abnormalities in the Chiari II malformation, II: tectal morphologic changes. J Ultrasound Med. 2009 Jan. 28(1):29-35. [Medline]. Wong SK, Barkovich AJ, Callen AL, Filly RA. Supratentorial abnormalities in the Chiari II malformation, III: The interhemispheric cyst. J Ultrasound Med. 2009 Aug. 28(8):999-1006. [Medline]. Chiari H. Uber veranderungen des kleinhirns, des pons und der medulla oblongata in folge von congenitaler hydrocephalie des Grosshirns. Denschr Akad Wiss. 1896. 63:71-116. Coley BD. Ultrasound diagnosis of luckenschadel (lacunar skull). Pediatr Radiol. 2000 Feb. 30(2):82-4. [Medline]. Curnes JT, Oakes WJ, Boyko OB. MR imaging of hindbrain deformity in Chiari II patients with and without symptoms of brainstem compression. AJNR Am J Neuroradiol. 1989 Mar-Apr. 10(2):293-302. [Medline]. el Gammal T, Mark EK, Brooks BS. MR imaging of Chiari II malformation. AJR Am J Roentgenol. 1988 Jan. 150(1):163-70. [Medline]. [Full Text]. Huppert BJ, Brandt KR, Ramin KD, King BF. Single-shot fast spin-echo MR imaging of the fetus: a pictorial essay. Radiographics. 1999 Oct. 19 Spec no:S215-27. [Medline]. [Full Text]. McLone DG. Images in pediatric neurosurgery. Chiari malformations. Pediatr Neurosurg. 2000 Mar. 32(3):164. [Medline]. McLone DG, Naidich TP. Developmental morphology of the subarachnoid space, brain vasculature, and contiguous structures, and the cause of the Chiari II malformation. AJNR Am J Neuroradiol. 1992 Mar-Apr. 13(2):463-82. [Medline]. Naidich TP, McLone DG, Fulling KH. The Chiari II malformation: Part IV. The hindbrain deformity. Neuroradiology. 1983. 25(4):179-97. [Medline]. 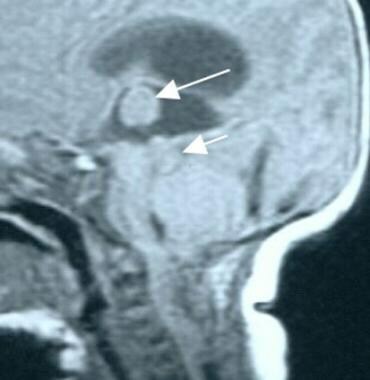 Antenatal magnetic resonance image shows a Chiari II malformation in a fetus. Courtesy of Umit Aksoy, MD, Uludag University, Bursa, Turkey. This T1-weighted axial magnetic resonance image demonstrates heart-shaped incisura and a petrous ridge in a patient with a Chiari II malformation.